The old stereotypes are crumbling! Where once viewed as brain-rotting time-wasters, innovative educators around the world are beginning to shed a new light on video games as meaningful, engaging, and powerful tools for learning. Commercially successful games as powerful tools for learning? Yes! Join Lucas Gillispie as he shares how games like World of Warcraft, Minecraft, Portal, and others are not only valuable for entertainment, but have tremendous potential for classroom learning. We?ll look at what the academic experts are saying, explore real-world examples of video game integration into instruction, and challenge the very foundations of traditional education as we chart a course for the future of video game-based learning. Lucas Gillispie is an Instructional Technology Coordinator for Pender County Schools in southeastern North Carolina. An avid gamer, he is passionate about the integration of video games into the learning environment. In 2009, he founded the WoWinSchool Project, http://wowinschool.pbworks.com, a program designed to explore the educational potential of games like World of Warcraft with at-risk middle grades learners. Lucas oversees a district-wide Minecraft implementation, http://minecraftinschool.pbworks.com, of over 300 student accounts, while providing professional development on game-based learning to teachers in his district, state, and beyond. His most recent project, SAGA (Story and Game Academy) aims to encourage middle grades students to build reading and writing skills through video games on platforms ranging from the X-box to the Play-Station, http://storyandgameacademy.pbworks.com. When he is not supporting his guild in the battlegrounds of Guild Wars 2, he blogs about games in education at: http://www.edurealms.com. The unifying aspect of the Carolina Games Summit is its dedication to informing the public that simulation and game design is a viable career choice for today?s youth. Michael Everett Creative Director for the Carolina Games Summit says, ?Visitors can experience presentations from industry visionaries, plan for a future in the game development field, and enjoy fiercely competitive tournaments all at one event." 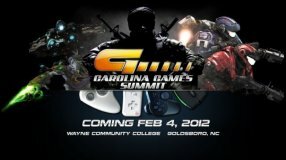 Prospective attendees can register online now at www.CarolinaGamesSummit.com for just $10, this price also includes full access to all the speakers, exhibitors, tournaments and excitement Carolina Games Summit has to offer.